There’s really nothing like the joy of gardening, connecting with nature, the pride of growing your own plants, flowers, food and of course, the amazing health benefits. It’s also well documented that gardens, no matter how big or small, have the potential to bring people and communities together, which is why on Sunday 21 October the call to action for South Africa’s annual Garden Day is to down tools, invite neighbours, friends and family round to celebrate your garden together. Now in its third year, Garden Day sprouted as an idea from a group of enthusiastic, gardeners who wanted to start a movement to unite South Africans by creating a day where everyone can enjoy and celebrate their gardens together. This Garden Day South Africans are once again encouraged to sow the Spirit of Ubuntu. So if you’ve been admiring your neighbour’s garden from afar, intrigued by their rambling roses or eager to learn more about their striking succulents, Garden Day is the perfect time for you to branch out and cultivate relationships with those around you. Enjoy a glass of wine or a cup of tea. Make flower crowns for your guests. What you do on Garden Day (Sunday 21 October) is completely up to you but it’s a great opportunity to get together and celebrate your garden. For more ideas and Garden Day inspiration, visit www.gardenday.co.za. 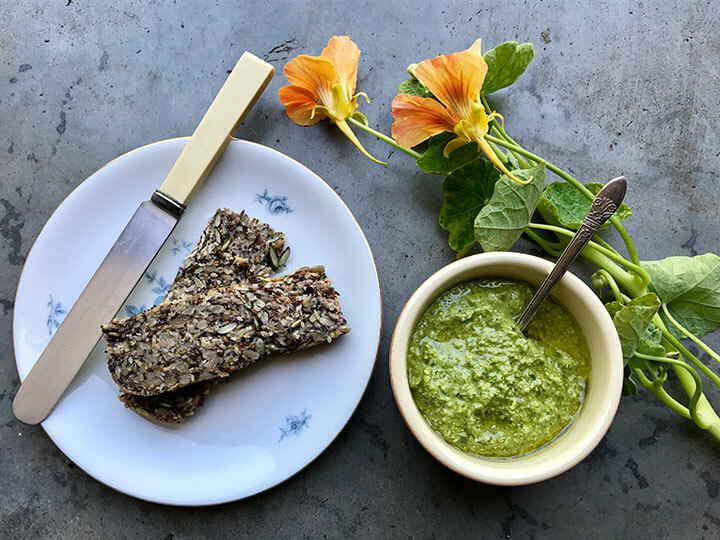 Make this nasturtium pesto, from Luke and Jess at Table at de Meye, if you have friends coming over this Garden Day! Place seeds, nasturtium leaves, garlic, onion and cheese into a blender. Slowly add olive oil whilst blender is running, until a smooth paste is formed. Season to taste with salt and lemon juice. Pumpkin seeds can be substituted with toasted pine nuts, and goat’s pecorino can be replaced with Parmesan.